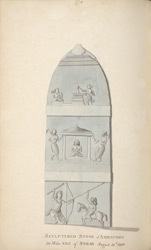 Watercolour drawing dated 31 August 1801 of a memorial stone at 'Amrapore 30 miles NNE of Serah', taken from an Album of 56 sheets of drawings (60 folios) mainly of miscellaneous architecture and sculpture in the Deccan and S. India, dated 1793-1806, from the MacKenzie Collection. India has a very ancient tradition of erection of memorial stones. These have various local names, viragals, hero-stones, being one of them. The establishment of memorial stones normally followed the death of a hero in a battle and was related to political, social, economic and religious casues. Hero-stones generally consist of stone upright slabs with carved panels and inscriptions. The bottom panel of the stone in this drawing depicts the hero in combat with the enemy, the middle panel depicts the death of the hero and the top panel represents the hero worshipping the Shiva-lingam.